Striata Posts Customer Communications If iPhone and BMW can do it, why can't an eBill? If iPhone and BMW can do it, why can't an eBill? Whilst I’ve never been directly involved in consumer product development, it strikes me that to ensure success, there is at least one fundamental requirement: the new product should be better than the one it’s replacing. When the iPhone 3G was introduced, it took all the attributes and features of the old model and added faster networking. The latest flat-screen televisions are clearer, larger but much thinner than the bulky old CRT models, and hence fit into our lifestyles (literally!) much better. The latest BMW 5-series is faster, more economical, less polluting, better looking and better equipped than the old model. So ‘improvement’ is truly a fundamental requirement… unless, it seems, you’re introducing an eBilling product… in which case it appears that you’re allowed to remove the customer’s convenience of having the bill delivered to their doorstep, and provide them no additional benefits in return. Is it really an upgrade? The paper bill has recently had an ‘upgrade’. Today in Asia, the average eBilling offering is an in-house development and falls into 1 of 2 categories: either the customer must register and then log into the biller’s portal to pull their bill details from the website, or else a pdf or html version of the printed paper bill is pushed to them via email. So, just where exactly is the benefit to the customer in these situations? The portal-based solution is certainly far less convenient than paper; there’s a website registration process, another id/password to remember and the need to download the bill if you want to store or print it locally. 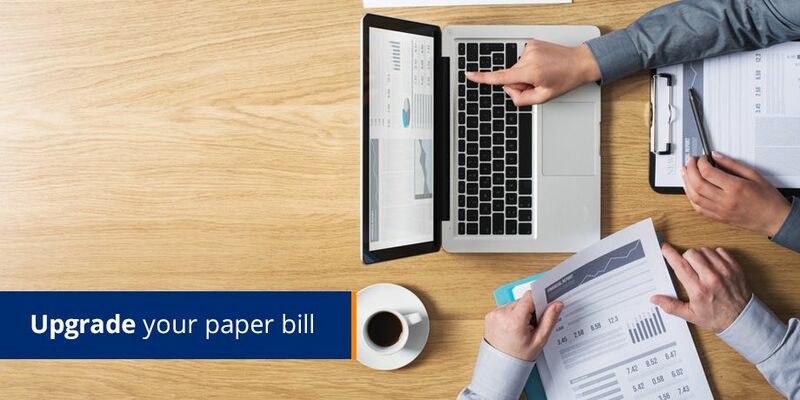 Plus, while a flat pdf or html rendition of the printed bill delivered via email could be considered as convenient as a paper bill (or perhaps more convenient to some customers), it doesn’t add any real value to the billing experience. Did BMW or iPhone pay their clients $5 to upgrade? Giving a $5 credit on the next utility bill for registering for eBilling, or charging $2 per month for a paper bill is a clear indication that your eBilling product doesn’t meet your customer’s requirements. If there’s no real value for the customer – no added convenience, they just won’t go for it! And that’s why many end-customers need to be cajoled and pressurized into adopting eBills and turning off paper. They just don’t see a benefit in it for themselves. What does a real bill upgrade involve then? Well, the minimum starting point is actually emailing the bill to your customers – you always delivered the paper bill, so don’t expect your customers to be happy by now having to go fetch their eBill from your portal. But then let’s add a payment form within the eBill, to allow bill payment without visiting (and logging onto) another website. Not only is this convenient, but your cash-flow will improve significantly because many people will pay the same day they get their bill. Then we can include the facility to slice and dice the bill details and dynamically graph say, IDD vs local calls or peak vs off-peak energy consumption. Or let’s allow the customer to upload the bill details into Excel or their accounts package for further convenience. And how about targeted marketing? Done properly, marketing within eBills (transpromotional marketing) is a real value-add to the customer, and a great new channel for generating additional revenues. Suddenly eBilling sounds like something worth having for the convenience and benefits provided to the customer; not just something reluctantly accepted to avoid surcharges for the paper bill. Sure, you’ll still have to market your eBilling offering, but you won’t have to threaten, pressurize and cajole your customers, wearing them down until you eventually hit double-digit adoption rates. They’ll like it, they’ll want it and they’ll tell their friends about it. And best of all, this functionality and more is readily available through eBilling suppliers such as Striata; no need to develop/maintain such complex solutions in-house.